In 2010, 35-year-old Dubliner Alison McCormack's world was turned upside down when she noticed a lump in her right breast. Alison was referred to the breast clinic at St James's Hospital in Dublin where in September 2010 - following a series of tests - she was diagnosed with DCIS (Ductal carcinoma in situ) a localised form of breast cancer. "The consultant basically said I had DCIS which is ductal carcinoma in situ, she said of all the cancers to get that's one of the best ones because it's actually pre-cancerous, it's Stage 0 cancer. So my surgeon had explained you're lucky to have DCIS, as in it's a cancer that is curable by surgery," Alison explained. She went on to have a mastectomy and breast reconstruction but because her cancer was diagnosed as non-invasive, it was decided that further treatment like chemotherapy wasn't needed. "Had Alison not pursued the questioning that she was determined to find out about, there is absolutely no way she would ever have learned that there was a mistake on the part of this hospital." Two years later in October 2012, Alison discovered what seemed like a lump in her neck and she was again referred to St James's Hospital where she underwent more tests. Alison added: "I saw my own consultant and she said that they'd looked at the biopsy and it was the original breast cancer that was back. It was the DCIS and it had now spread into the lymph nodes of my armpit and up to my neck. "So we were shocked and we couldn't, we couldn't understand it and actually she couldn't understand it either. She basically said it's very rare for DCIS to come back." As Alison came to terms with what she believed was the return of her original cancer, she began a year-long treatment plan, including an aggressive six-month course of chemotherapy. She had all the lymph nodes in her right arm removed and had five-and-a-half weeks of radiation. The treatment has left Alison with lifelong health issues, including lymphedema, which results in severe swelling of her right arm. Over the following months Alison focused on getting through her treatment, but she was constantly wondering why her cancer had come back. "......these are very, very fundamental and serious errors so they are red flag type of errors. And so in my opinion that is of concern." So in late 2013, Alison began to ask questions and at her request a meeting with St James's Hospital was arranged. At that meeting Alison was informed for the first time that her cancer had actually been misdiagnosed, almost a full year after she re-presented at the hospital with cancer in her neck. A few weeks later, St James's Hospital sent Alison a copy of a report into her missed diagnosis. When Alison read the report she realised the hospital had actually been aware of her misdiagnosis since February 2013 but she had not been told. Alison's solicitor Rachael Liston said: "Had Alison not pursued the questioning that she was determined to find out about, there is absolutely no way she would ever have learned that there was a mistake on the part of this hospital." The 27-page review confirms that on Alison's first presentation at the hospital in 2010, the lump in her breast was reported as showing Ductal carcinoma in situ or DCIS only - that is an early and localised form of breast cancer that is non invasive. However, when Alison re-presented in 2012 with a lump on her neck, the hospital reviewed her original pathology slides, which revealed they had actually shown invasive breast cancer, but this cancer had been missed by the pathologist. But the hospital report reviewing Alison's care concluded "The error, in either not identifying the small focus or not appreciating that it was in fact invasive rather than in situ carcinoma, was an error that could have been made by any competent pathologist." And so "... should be characterised as a sporadic human error and did not represent incompetence on the part of the original reporting pathologist". To support their belief, St James's Hospital decided to review a portion of the pathologist's case load. In all, the doctor had analysed more than 300 breast cases in 2010 - the year of Alison's misdiagnosis. The review looked at every tenth case, as well as a further nine DCIS cases - that is cases with a pre-cancerous diagnosis similar to Alison's. Of the 39 cases reviewed by the hospital, two were found to have been misdiagnosed, including Alison's case and another unidentified patient. But both cases came from the DCIS category only, meaning the pathologist had misdiagnosed two out of nine cases - an error rating in excess of accepted international pathology norms. 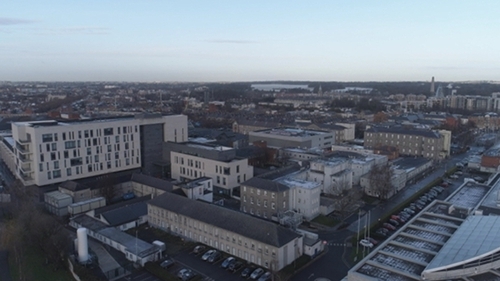 As part of a successful legal action taken by Alison against the hospital her case was examined by a number of UK experts, including Professor Ian Ellis, a leading consultant pathologist based at Nottingham City Hospital. Professor Ellis said: "It sounds very small, two out of 39, but these are very, very fundamental and serious errors so they are red flag type of errors. And so in my opinion that is of concern. The number of breast cases that he had looked at were a few hundred, that's not a huge number of cases and certainly if I was asked my opinion on what to do I would recommend a review of all the cases." But St James's Hospital decided a full review of all breast cases examined by the pathologist was not required. This pathologist did not work on breast cases alone. In fact during the time he spent at St James's, he analysed specimens on almost 2,700 cases including other specialties. His performance in these areas has never been examined. In a statement to RTÉ Investigates, St James's Hospital said it "fully acknowledges that the missed diagnosis error occurred ... For this the hospital was and remains unequivocally sorry". It goes on to say the internal report "involved a 100% review of the particular type of misdiagnosed cancer and a 10% review of all breast pathology cases reported by the pathologist in question. "On the basis of the contents of the report … any further review of the remainder of the pathologist's work is not warranted. No evidence of further missed diagnoses has arisen in the nearly eight years since the error occurred." On the issue of not informing Ms McCormack of her misdiagnosis in a timely manner, the hospital said it treated the review of her case, which was completed in February 2013 "as part of the overall review and shared it with the patient together with other related documents in November 2013 when the review was complete", which was some nine months later. In a statement, the Irish Cancer Society said that it "would be very concerned about this and other recent cases where a lack of transparency in dealing with cancer misdiagnosis has been displayed. "No patient should have to pursue answers like Alison McCormack had to. We need answers as to why this occurred and why it was kept from Ms McCormack for so long."